The last Teenage Mutant Ninja Turtles movie made great strides to change the origin stories of the titular team, and most of the main characters as well. It looks like that pattern will continue in Teenage Mutant Ninja Turtles 2, as actor Stephen Amell has revealed that the vigilante Casey Jones will be undergoing some changes as well. 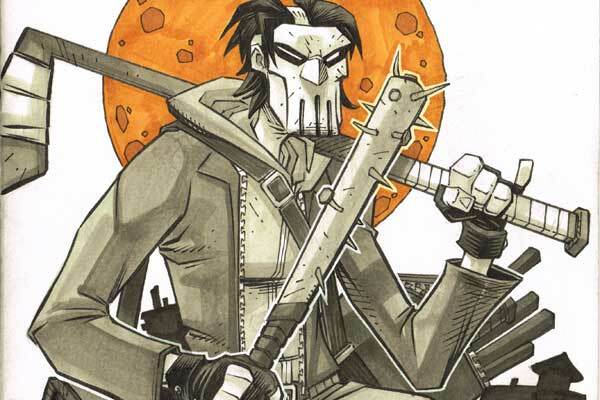 He is not the Casey Jones that a lot of comic fans have come to know and love. He is a guy with a job that lives in New York and loves hockey. When things go awry, [and] when he goes through the normal methods of what someone would do when they’re [a] law-abiding citizen and he’s met with laughter and scorn… he decides to take things into his own hands. Judging from Amell's comments, it sounds like Casey Jones won't be turning into a vigilante until he reaches adulthood as a result of being sick of the police. This is a deviation from the original comics in that Jones actually started on his path towards crime fighting when he was a kid. He worked with his dad in an auto shop, but saw his life change forever when gang members killed his father and burned the shop down. He later begins sporting a hockey mask and kicking the crap out of bad guys with sports equipment, and becomes a close ally of the Teenage Mutant Ninja Turtles. Casey Jones isn't the only classic TMNT character being introduced in Teenage Mutant Ninja Turtles 2, and it will be interesting to see how the likes of Baxter Stockman (Tyler Perry), Bebop (Gary Anthony Williams), and Rocksteady (Stephen Farrelly). All of those character have very specific origin stories of their own, and one has to wonder if they will be manipulated to serve the plot of the new movie. Teenage Mutant Ninja Turtles 2 is being directed by Dave Green (Earth To Echo), and nothing is really known about the plot just yet - save the fact that they will be saving New York City from a new threat. Megan Fox, Alan Ritchson, Noel Fisher, Jeremy Howard, Johnny Knoxville, Tony Shaloub, and William Fichtner will all be back to reprise their roles from the first movie, while other new cast additions include Laura Linney, and Biran Tee as Shredder. The film is currently in production, and will be released by Paramount Pictures on June 3, 2016.